When Choclette, of the Chocolate Log Blog and co-owner of the 'We Should Cocoa' challenge, asked me to guest host while Chele of Chocolate Teapot was taking a break, I jumped at the chance. Then the panic set in. What would I choose to go with chocolate? There have been a frightening number of WSC challenges and they cover a multitude of flavours. I scanned the list and realised that there had been no challenge using CHERRIES! If you haven't heard about We Should Cocoa before, scroll down to the bottom of this post for details. My entry is this gorgeous Chocolate Cherry Cake baked to a recipe by Jason Atherton from the Baking Mad.com website. It's a bit like a cross between a giant chocolate brownie and a black forest gateau! It's worth noting that it gets better with keeping, so make it a couple of days before you want to eat it. 1. Preheat oven to 180C/gas 4. Place chocolate and butter in a bowl over a pan of simmering water. Melt, then cool and stir in ground almonds and flour. 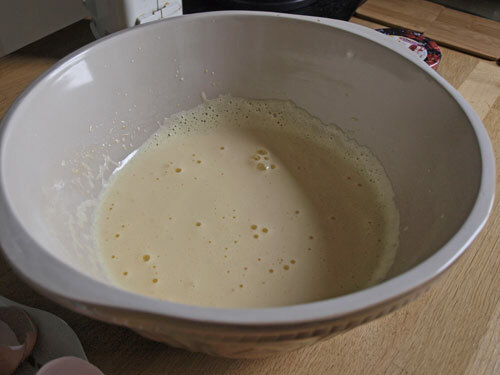 In a separate bowl, whisk the eggs and sugar for 5 minutes, then fold the egg mixture into the chocolate. 2. 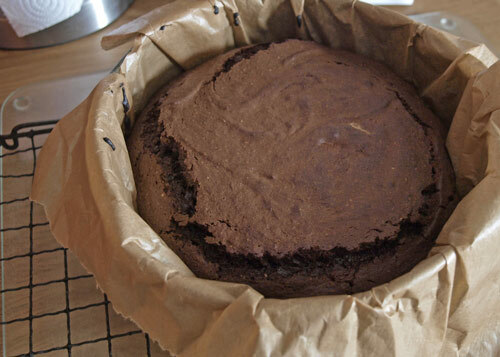 Line a 20cm cake tin with baking paper and spoon in the cake batter. Bake for 20-25 minutes, until set but slightly soft in the centre. remove from the oven, allow to cook in the tin then transfer to a wire rack. Spread with warm cherry jam and top with fresh cherries. Silver Spoon sugars are made from sugar beet which is a large pale brown root crop, similar to parsnip which grows in the temperate climates of Europe and North America. The sugar beet that goes into Silver Spoon sugars travels a short distance to the factory (an average of only 28 miles) direct from the fields around Bury St Edmunds in East Anglia. Silver Spoon work with 1,200 local farmers to grown the beet, which is then made into their range of homegrown sugars for families all over the country. 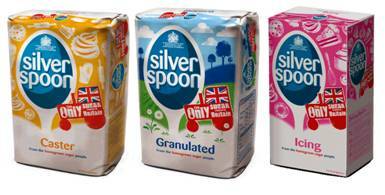 Silver Spoon are committed to reducing energy use, emissions and waste at every stage. All raw materials in the factory are aimed to be transformed into sustainable products. Disclaimer: Baking Mad supplied me with the ambient ingredients for this recipe, I was not required to write a positive review and any opinion expressed is my own.. The idea is to make something with chocolate each month. You can use any sort of chocolate or cocoa substance and use any ingredient that you like. But you must include the special ingredient or ingredients selected by the host. It can be sweet or savoury, simple or complicated; be as creative as you like. You can use anyone’s recipe (acknowledging the source of course) or make up your own. 1. Post your recipe on your blog – accompanying photographs would be nice. 2. Mention “We Should Cocoa” in your post and link back to Farmersgirl Kitchen Chocolate Teapot and Chocolate Log Blog. 4. Entries should be submitted no later than midnight of the 25th of the month. 5. The round up of entries will be posted on the relevant host’s blog on or before the last day of the month. 6. The new challenge will be posted on the 1st of the month. 7. 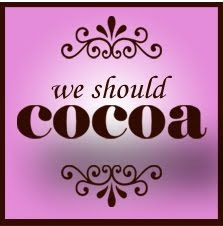 If mentioning on Twitter you can use the tag #weshouldcocoa and I will endeavour to retweet. fab idea... I loved the blackberries and didn't think i'd like the fruit/chocolate thing at all so I look forward to using cherries... I have an idea already! Ooh, your chocolate cherry cake looks delicious! Ooohh ooh and double ooh! Chocolate and cherries. Count me in! Great choice Janice. chocolate and cherries are a real classic - bring on those Black Forest Gateaux! Your cake looks fabulous and sounds very tasty. 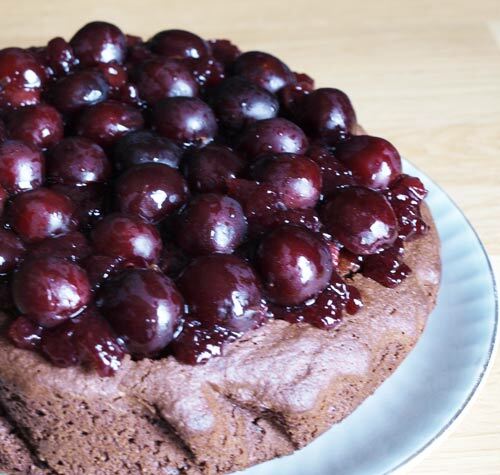 Cherries are a great choice - loads of things you could do but black forest gateau is such a classic I think that might have to be what I go for! OH yes! I may even make that classic Black Forest Gateau! GREAT choice Janice and I am IN! Can I enter something I posted on my blog already (but very recently)? I don't eat cherries and have never made anything with them, so doubt I will make anything else this month - is that OK under your rules if I repost it and add the badge and labels etc? Please let me know! Oh crumbs. Where am I going to get cherries from in the middle of winter. Oh, unless I find some soaked in booze... now you're talking! Sorry Caroline, I've checked with Choclette and it has to be new posts I'm afraid. I love cherries but haven't ever cooked them with chocolate. I think it's about time I did! What a lovely cake Janice. 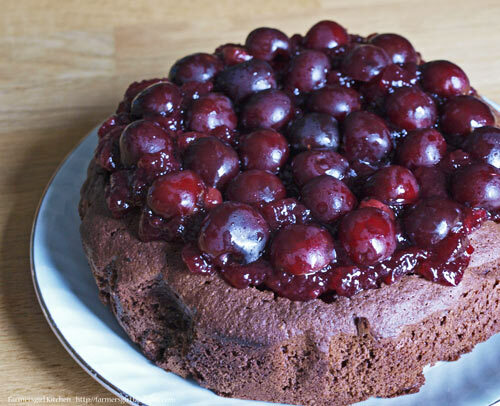 Love cherries and chocolate and this cake even more as there is no cream in it! Yay! Good luck with the challenge - I'm sure you'll do well! Chocolate and Cherries? Totally a good combo. Definitely a must do recipe! That is a great cake Janice. Beautiful cake and great challenge. Brilliant combo too! Oh and I will have a wee think. Loving the look of your cake, chocolate and cherries is one of our favourite combinations! I'm joining in for the first time this month, though have meant to do so most months. Thanks for joining in for the first time, have you linked your entry on the linky thing? I was reading the roundup and was like, ooh, mm, ooh , mmm, ohh! Can't decide what sounds best, I want them all! Walnut Brownie Cupcakes - Hello Cupcake!